The U.S. Army wants to push its long-range guns into territory artillery officers have previously only dreamt of. The service’s Strategic Long Range Cannon is projected to fire way, way, way farther than any existing gun, or any gun ever made. And ironically, developments in Iraq during the regime of Saddam Hussein hint that such a weapon is actually possible. Last week, according to Military.com, the head of the Army’s Futures Command, General John “Mike” Murray, told Congress the service is working on a new cannon. The Strategic Long Range Cannon (SLRC), according to Murray, would have a range of up to 1,000 nautical miles—or 1,150 miles. A cannon with a 1,150 mile range is fantasy-land capability. 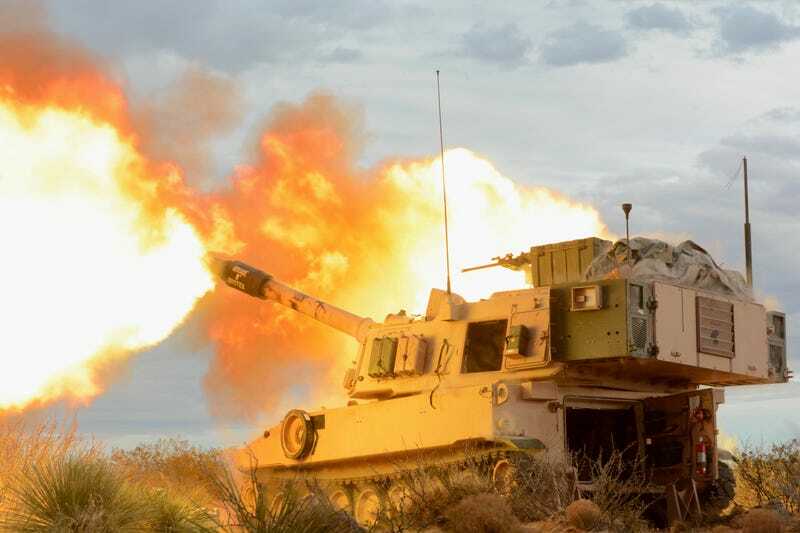 The Army’s largest guns, the M109A7 Paladin self-propelled howitzer and the M777 towed howitzer, are 155-millimeter guns with a maximum range of 18.6 miles. The Long Range Land Attack Projectile, a round specially designed for the Zumwalt-class of destroyers and then promptly cancelled over cost concerns, has a range of about 85 miles. Even the massive 16-inch guns of the Iowa-class battleships had a range of only 23 miles. How in the world does the Army intend to reach 1,150 miles? That’s a really good question. Gerald Bull with one of his many long range gun projects, Montreal, 1965. In the 1960s, Canadian artillery engineer Gerald Bull built the High Altitude Research Project, or HARP. HARP was basically a large gun consisting of of two 16-inch naval gun barrels welded end-to-end. Constructed on the island of Barbados, the HARP gun was 118 feet long and weighed 100 tons. HARP was conceived as a satellite launch vehicle and could reliably loft projectiles up to 111 miles into space, but was cancelled in 1967. In the 1980s, Iraqi leader Saddam Hussein commissioned Bull to work on his dream project: a supergun designed to be the largest ever made. The “Baby Babylon” gun had a bore diameter of 330-millimeters (as opposed to the M777’s 155-millimeters) and was one hundred feet long. It would have had a range of 400 miles if adequately mounted. But “Baby Babylon” was only a prototype—Bull believed the fully operational system, cleverly called “Big Babylon” would have had a bore diameter of 914 millimeters and powerful enough to launch a 1,322 pound projectile a distance of 528 miles. A 50 meter long test gun built by Gerald Bull in Canada, 1990. Bull envisioned his project could a “satellite launch vehicle,” but to the Iraqis funding his project it was almost certainly a weapon to use against Israel and other regime enemies, capable of lobbing huge projectiles filled with high explosives or even chemical weapons against Israel. Bull was assassinated in Belgium in 1990, shot five times in the neck and back with a suppressed 7.65mm pistol. Bull is suspected to have been assassinated by Israeli agents. So the Strategic Long Range Cannon could be a “Son of the Big Babylon”, simply an enormous gun with a long barrel using high performance propellant powder. If the Army did built something akin to “Big Babylon”, it would likely trade a smaller projectile for greater range. GPS guidance means that artillery shells can land within just a few feet of the target, requiring a smaller projectile with less explosive power to destroy it. Another possibility is SLRC is a giant railgun. Instead of using chemical energy in the form of gunpowder, a railgun would use tremendous amounts of electricity to power rows of electromagnets. The U.S. Navy’s railgun prototype uses up to 25 megawatts of power—enough to power 19,000 homes, and with a range of over 100 miles still doesn’t come anywhere close enough to the desired 1,150 mile range. A rocket booster could cut down on the amount of juice needed, kicking in as gravity slows the projectile down. U.S. Navy prototype railgun, Dalhgren, Virginia. SLRC would change the rules of modern warfare. 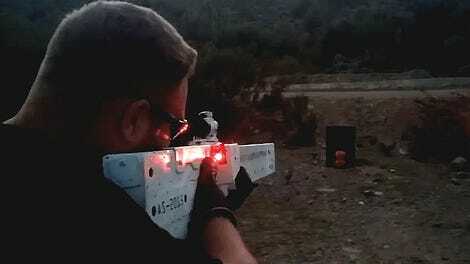 A gun based in southern Germany could hit targets as far away as western Russia, though falling short of Moscow itself. The Army would use SLRC to attack targets far behind enemy lines, such as army-level headquarters, ammunition depots, fuel dumps, and other high-level targets. Although many of these targets would ideally be serviced by the U.S. Air Force, SLRC would give the Army the capability to hit targets quickly without reaching out to another service, and without endangering pilots. Whatever SLRC is, it is almost certainly too large to put on a vehicle, even a train. The gun could be built at a fixed location—say, a U.S. Army base in Bavaria—buried under hundreds of tons of reinforced concrete, and pointed east. During wartime its range would make it Enemy of the Motherland No. 1, and Russia would likely try very hard to disable it with tactical aircraft and cruise missiles. Is the Strategic Long Range Cannon a feasible concept? It’s hard to say. Gerald Bull clearly thought a chemical version was possible. 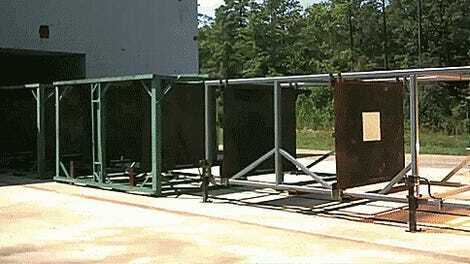 As for railgun technology, the Army’s railgun projects have been fairly hush-hush. Something is making the Army’s Futures Command optimistic enough to mention it to Congress. Foxtrot Alpha will report more as we hear about it.